Online privacy is becoming a huge issue these days and the emergence of social networks has only put a spotlight on just how much companies know about our online activities . What’s just as disturbing is the cavalier attitude taken by those very companies collecting your personal data. It would seem that privacy is truly becoming a thing of the past and that we’re slowly being put at the mercy of organizations whose goals are not to protect privacy as much as they are to monetize it. So never fear! 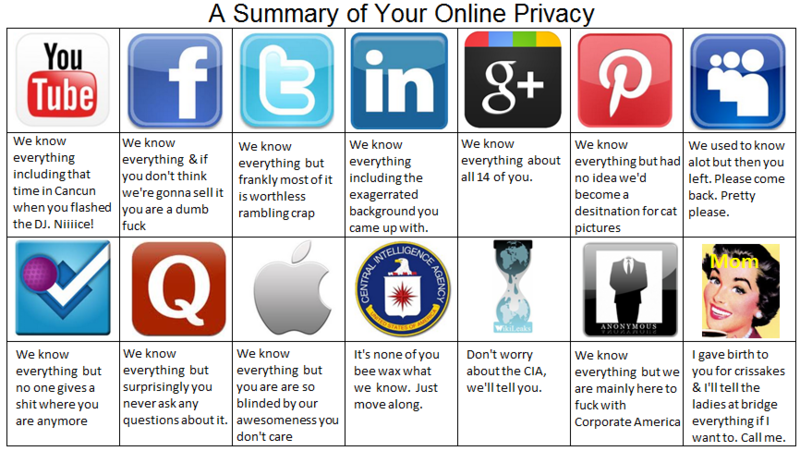 As a service to you, my loyal readers, I have taken it upon myself to read through the privacy policies of the most popular social networks and summarized them below in an easy to understand chart. Your welcome!